RENAULT CLIO GENUINE MOCAL 13 ROW OIL COOLER KIT. Clio MK1/2 1990 - 2005. OIL COOLER KITS AVAILABLE FOR MOST MAKES & MODELS - PLEASE SEE OUR SHOP ITEMS. 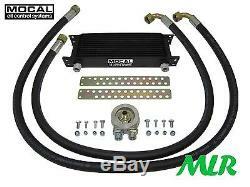 This is a brand new MOCAL 13 row oil cooler kit for Renault Clio. 13 row x 235mm oil cooler. 2x 1/2bsp hose and fittings. Rough Guide: A 13 row cooler should be adequate to cool most naturally aspirated engines up to around 150bhp (FOR TRACK USE) given an installation with good airflow, after this a larger cooler will be required. For road use a 13 row oil cooler is usually adequate for engines up to approx 200bhp in all but extreme conditions, after this a larger cooler will be required. Exact cooler size required depends upon: The type of use, ambient temperature, spec of the engine (internal friction, rev range, power etc), airflow through the cooler and over the sump. If you are using your car for any form of track, competition or high performance use then the engine oil will need cooling. The most common cause of competition / high performance engine failure is loss of oil pressure, as the oil heats up it becomes thinner. This lowers the pressure produced by the pump and increases the oil escape from the bearings lowering the overall pressure further still. Roughly speaking you need about 10psi of oil pressure per 1000rpm. 7000rpm requires 70psi oil pressure. If the pump cannot meet this demand when the oil is hot/thin engine failure will result - usually in the form of running a crank bearing (death rattle) or throwing a rod through the side of the block! This is especially important on part worn engines - a cooler/thicker oil will give the oil pump a fighting good chance of meeting the demand. On a new or part worn engine if the oil pressure is maintained, the engine isn't over revved or over heated there is no reason for failure. For track, competition or high performance use a rough target temperature for the oil is around 100°C. Over 100°C the oil thins out rapidly and therefore drops the pressure. TURBO SYSTEMS WILL ROCKET THE OIL TEMPERATURE. In very cold/wet weather over cooling of the oil can be avoided by the addition of a thermostat built into the sandwich plate. An amended invoice will then be sent. (Some fitting tips & tightening torques are included). PLEASE VIEW MY SHOP ITEMS. (The despatch date will be printed on the parcel address label). (Due to address queries/bad weather/locational errors etc). We are happy to do our best to answer sensible, genuine questions during our normal office hours (Mon-Fri 9-5), however please note we do not have intimate knowledge of all makes & models or have personal experience of fitting/using all our products. Products only fit models stated if products fit other models its in our favour to say so! Are not designed for any one model. Models suggested are appropriate for the product listed but please check specs/sizes where stated. Please allow 24h for us to respond to your question. Please also note the despatch. Times stated on the listing. Most of our products are NOT designed for DIY fitting and in some cases instructions are not included - we state this when applicable. We do not prioritise feedback, due the time consuming nature of the feedback we do them in blocks of 2-300 at a time after orders have been sent & questions answered. Despatching orders & answering questions are our first & second priority. Please be assured feedback will be left at our earliest convenience. The item "RENAULT SPORT CLIO 172 182 CUP TROPHY 2.0 16V WILLIAMS MOCAL OIL COOLER KIT RV" is in sale since Thursday, August 3, 2017. This item is in the category "Vehicle Parts & Accessories\Car Tuning & Styling\Engine, Tuning & Chips\Other Engine Tuning". The seller is "mattyzx" and is located in Dorking,Surrey. This item can be shipped worldwide.